19 February 2016. 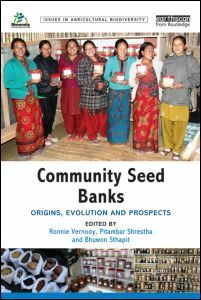 Community Seed Banks: Origins, Evolution and Prospects is the latest book in the ‘Issues in Agricultural Biodiversity’ series to be made available to download for free on our website. Earlier this year, book editors Ronnie Vernooy, Genetic Resources Policy Specialist and Bhuwon Sthapit, Senior Scientist at Bioversity International and Pitamber Shrestha, Program Officer with Local Initiatives for Biodiversity, Research and Development (LI-BIRD), discussed the origins of seed banks and their achievements and potential as key rural organizations, in light of the book’s publication. Read their blog on the Routledge Sustainability Blog. The ‘Issues in Agricultural Biodiversity’ series, published by Earthscan/Routledge in association with Bioversity International, reviews the current state of knowledge on agricultural biodiversity, identifies gaps, synthesizes lessons learned and proposes future research and development actions. Issues range from conservation biology of genetic resources through social sciences to policy and legal aspects.